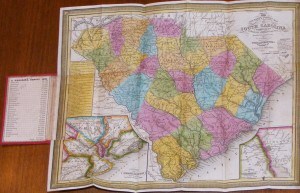 Would you like to see a copy of Mitchell’s “Tourist’s Pocket Map of North Carolina”? 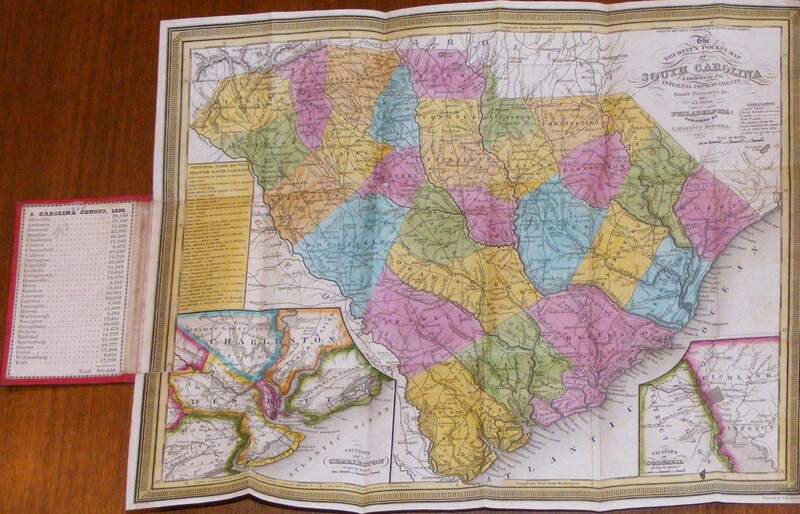 In the 1830s, S. Augustus Mitchell published a number of “Tourist maps” of various states in the form of pocket maps, including one of each of the four states that share a border with North Carolina. It is also proposed to publish as soon as possible as accompaniments to the Map of the United States A SERIES OF SHEET MAPS to embrace EACH STATE AND TERRITORY in the Union, showing the counties, post towns, post roads, and a multitude of minute particulars, which could not be introduced into a general map. Melish published sheet maps in the following order: Indiana (1817), Tennessee (1817), Illinois (1818), Alabama (1818), Mississippi (1819), and Louisiana (1820). The map of Tennessee has an engraver’s imprint dated 1817 below the mileage scale, and a publisher’s imprint dated 1818 outside the border at bottom center. 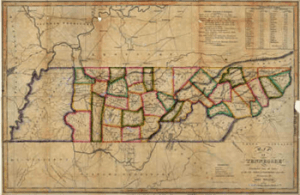 1817/18 map of Tennessee by John Melish, based on surveys by John Strother. Image courtesy of Tennessee State Library & Archives. Click thumbnail above for zoomable image. Over a period of two decades from 1796 to 1816, German scholar Christoph Daniel Ebeling published seven volumes of an intended history of each of the United States. The first six volumes included the New England and middle Atlantic states; the seventh volume focused on Virginia. Early on, Ebeling realized the need for maps to accompany the work. Ebeling enlisted the aid of geographer Daniel Friederich Sotzmann to compile and draft maps for an Atlas von Nordamerika. While 18 maps were drawn, only 10 were actually published . 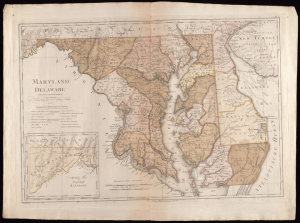 Of the 10 maps published between 1796-1800, the only one depicting a state south of the Mason-Dixon line was that of “Maryland und Delaware”. Image courtesy of Sterling Library and Beinecke Digital Collections, Yale University. What happened to Ebeling’s 18 manuscript maps, one of which, hopefully, was of North Carolina? As stated above, only 10 maps were engraved and printed. The quote from the Harvard web site, “While 18 maps were drawn…”, likely should have been stated as “While 18 maps were intended…” as no evidence has been found to indicate that any manuscript maps were created for any of the unpublished maps, with the possible exception of Virginia. Additionally, no surviving manuscripts for any of the published maps are known. If anyone knows more on this topic, please inform us via the “What’s on your mind?” comment box below. Thankfully, there are still plenty of existing North Carolina maps to study and admire. Would you like to suggest a North Carolina map topic for a future discussion? Please use the “What’s on your mind?” comment box below. Personal communication from Dave Morgan, C.A.R.T.E. Museum, Baton Rouge, LA. Mr. Morgan has confirmed Mitchell Tourist maps for Virginia, Tennessee, South Carolina, Georgia, Kentucky, Ohio, Indiana, Illinois, Michigan, and Pennsylvania. This entry was posted in Cartobibliography, General or Reference and tagged cartobibliography, Christoph Ebeling, Daniel Sotzmann, John Melish, north carolina maps, S. Augustus Mitchell by crmaps. Bookmark the permalink.